BEING is a welcoming community of artists, embodying a collaborative spirit that extends beyond the studio’s walls, honouring the beauty of unfiltered creativity. If you have a passion for creative expression in the visual arts and creative writing, the BEING studio can nurture and support you in achieving your unique creative and professional goals, whether it's to become more prolific, profitable, or simply to find focus for your creative practice. 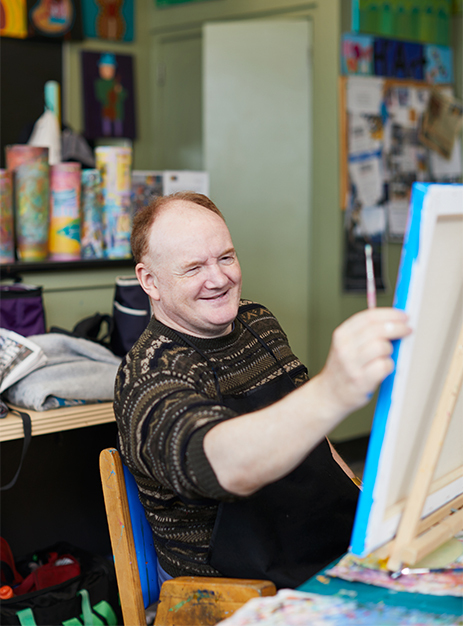 BEING studio is open to adults with developmental disabilities who are interested in exploring their creativity. In the studio, artists are supported by our staff, who provide one-on-one mentorship and facilitate workshops with guest artists. BEING also provides opportunities for artists to exhibit and sell their work. Proceeds from art sales made through the studio are divided evenly between the artist and BEING’s operating fund. Artists generally work in the studio one day a week, from 9:30 a.m. – 3:00 p.m. The studio currently supports artists working in drawing, painting, and creative writing. Occasionally we offer workshops in other media. The Bronson Centre is an accessible venue. The studio is located on the third floor and can be accessed by elevator. Attendant care workers are always welcome. Studio fees cover the cost of art materials, working space, support from studio facilitators, as well as exhibition costs and guest artist workshops.